Many people believe that a real wood product is indestructible. This is far from the truth. All it takes is common sense and the ability to pick up the phone and call us if you have ANY questions. We are here to help even after the sale. Dust and other normally occurring materials in a house contain tiny abrasive particles, much like fine sandpaper. When removed with a dry cloth, they cause tiny scratches in wood finish. Over time these tiny scratches will result in a changed appearance to the finish. To avoid this, simply use a soft damp dusting cloth. The cloth should be dampened with any furniture polish that does not contain silicone. We recommend products like Endust or Guardsman. Pledge is not a product we recommend. While it will polish and shine, it also prevents the ability to refinish your furniture in the future because of the silicone it contains. ALWAYS REMEMBER if it does not say on the can “does not contain silicone”, then it probably has it and should be avoided. It is also recommended that you frequently refold the cloth to a clean side. A dirty cloth can redeposit dust on the finish. All spills, regardless of what they are, should be wiped up as soon as they happen. Do not allow spills to harden or dry on the finish. This will make removing them that much more difficult and may cause damage to the finish or wood. If you do need to remove a dried spill, a clean cloth with warm soapy water is best. Your furniture responds to changes in temperature and humidity by expanding and contracting. Indoor humidity should be between 30-percent and 50-percent, and the temperature in the 60-degree to 80-degree range. Even with the proper settings, you still will notice a gap where the table halves or the leaves meet. Chances are that your table will fit tightly six months of the year and for the other six months there will be a gap. If the gap exceeds 3/16 of an inch yearround, then you should contact us for repair. PLEASE don’t panic if this happens. It is a natural characteristic of real woods to do this. 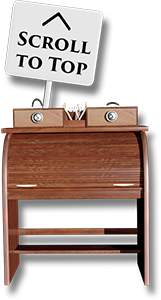 Due to the custom furniture needs of our business, it is very hard to price items on a website. Most everything can come in as many as 7 different wood species, 25 different stains and finishes, and the ability to customize pieces’ dimensions, style, etc. to fit your needs. We realize that people love to shop via the Internet because they don’t want to be bothered with pushy commissioned sales people; which is why NONE of our salespeople are paid ANY form of commission – they are all paid hourly. Feel free to send us an email or give us a call if you would like further details regarding the customization of pieces or prices for pieces you see on the site. Please be prepared with as much detail as possible when you call or email, so our employees know exactly what you want information about. You will be amazed at how reasonable it is to get EXACTLY what you want. To get in contact with an associate, please see our Contact page. While I would love to tell you everything there is to know about the Amish, I don’t think that anyone has the time. Nor does anyone really know the whole story. I will instead tell you of my experiences with several of my friends who just happen to be Amish, and throw in a bit of history, as well. The Amish get their name from the founder of their movement, Jacob Amman. Jacob was born in 1644 in Switzerland. He believed in preserving traditions and staying “more separate” from the world and all of its modernizations. He wanted to restore some of the early beliefs and practices of the Mennonite people of the same era. After their split from the Mennonites in the late 1600s, the Amish began to make their way from Switzerland to the United States in the early 1700s. They have settled all across the U.S., with population estimates ranging from 150,000 to upwards of 190,000. There are several large settlements of Amish east of the Mississippi. While Pennsylvania is believed to be the largest settlement, Wayne and Holmes County in Ohio are home to the largest settlement. Other areas include Indiana, Iowa, Wisconsin, and even Montana. All of the Amish furniture that you see in our showroom (with the exception of one builder from Wisconsin) comes from the two largest settlements of Amish in Indiana and Ohio. Each builder is hand picked by myself and my associates. Just as there is good and poor quality manufactured furniture, there is also good and poor quality Amish furniture. Each year, I take several weeks and go scouring the countryside in these communities to find the best of the best. I will never forget the time Tina and I took our kids with us on one of these trips. We stopped at one of my bedroom builders. While Tina and I talked with the builder, my kids were getting to know his kids. It happened to be his oldest boy’s birthday that day. He was about the same age as my oldest. When she asked him what he got for his birthday, he looked puzzled and asked, “what do you mean?” She replied with, “what presents did you get?” He answered with a grin, “I didn’t get any presents, but I don’t have to do any chores today and I get my favorite foods for supper!” I think both of my kids realized that our way of life is very different from the Amish. Despite the differences, both my children have grown up with a great deal of respect and appreciation for the Amish. We carry only Amish furniture that is made in true Amish shops. There are several “manufacturers” out there that claim to be Amish, when in fact they may have some Amish craftsmen working in the shop, but it’s not truly all Amish. Next time you’re in a store that sells Amish furniture, ask if you can have the phone number of the Amish shop that makes the piece of furniture you’re looking at, call the number, and see if a receptionist answers. Hmmm. Would a true Amish shop have a receptionist? Most all of the shops that we deal with have no electricity or fancy offices. You can’t just pick up the phone to check on an order. In most cases you have to leave a message on a voice mail and wait for them to check their messages when they get to the phone. Several of the builders that we deal with are strictly mail-based. It can take several days or a week just to check the status of an order. I do have some shops that have a phone in a booth at the end of their driveway. But for most of them, it is a quarter mile or more to the nearest phone. I have made several Amish friends in the past 20+ years of doing business with them. A few times a year you will see me out in one of the Madison restaurants with them as they pass through town either on business visiting their dealers or just passing through when visiting relatives. While they do drive horse drawn buggies back home, when they travel long distances they usually hire a driver and all pack into a full-size van. Several of the shops that we deal with do not do their own finishing. This is done by another Amish shop. This is by far the most important part of what separates us from all the other stores that sell Amish furniture. All of the furniture that we sell can be stained and finished to your liking – in more than 25 different options. From regular staining to painting, or from glazing to distressing; just because it’s Amish, doesn’t mean that we can’t do the trendy new finishes for today’s modern home. Please feel free to browse the site. Come back often as we will update it once a month. Also feel free to contact us should you have any questions about the furniture we carry, the finish that is on it, or the people and shops that build it. We have no secrets and will be glad to tell you all that you wish to know. Any store that won’t tell you these things may be hiding something. We have built a reputation in southern Wisconsin as the premier place to buy Amish handcrafted furniture. And because we have over 130 Amish shops building for us, nobody has more to choose from. Thanks for taking the time to read this page. I hope it has been informative. If you have any questions or comments please feel free to contact us. Don’s Home Furniture has been a long time in the making. Our mission remains the same today as it was then; to offer quality-built generational furniture. For over 30 years, we have continued to grow into a very sizable independent furniture store. When it all began back in 1986, the little 1,800 square foot store on Madison’s southeast side was called Don’s Collection of Reproductions. At the time, we carried mostly oak furniture that was new but made to look like the antiques of the early 1900’s. In the late 1980’s the store name was changed to Don’s Oak Furniture; reflecting the primary wood that filled the almost 10,000 square feet of growing showroom. To this day, many of our returning customers still use that name. Meanwhile, we had gained a reputation in southern Wisconsin as one of the best places to find quality oak furniture at reasonable prices. Throughout those early years, the company was owned and operated by Don Kotlowski and his wife, Pat Derer. Don had a background in antiques and knew that quality was something that was built into most antique furniture. That was the kind of quality that he wanted to sell in his store, so the search for quality vendors began. As time passed, the need to sell Amish furniture became clear. It seemed that the Amish had exactly what was missing from most factory built furniture – pride of craftsmanship. It was about this time that the business had started to outgrow Don. In the fall of 1992, he decided to sell the business to his son-in-law, Blaine Neupert. Blaine and his wife Tina, took over general operation of the business in 1993. Blaine’s background in sales and marketing would prove useful. Both Blaine and Tina had worked in the business from the beginning; so, with the guidance of Don and Pat, they started down the road to self-employment. The first several years saw the continued expansion of business. By the mid- to late-1990’s, the owners had decided that the majority of the furniture we sell would come almost exclusively from the Amish. Blaine and Tina began making several trips to the Amish communities in Ohio and Indiana to find the best Amish shops. These shops are all true Amish shops with some as small as one or two craftsmen building quality furniture the way it should be made – one piece at a time. As sales grew, so did the need for more space. Oak was also no longer the only species of lumber that found its way onto the showroom floor. Cherry, maple, and hickory soon became a part of the growing floor plan. With all of the new product and new craftsmen, a larger warehouse was added in 1996. By 2001 it was clear that more showroom space was needed as well, and so an addition to the east side showroom was started. Completed in early 2002, the newly expanded space was almost a full 20,000 square feet. This made Don’s Oak Furniture one of the largest all-wood furniture stores in the Midwest. In 2003, Don’s doubled its size by adding a west side location for a total of 40,000 square feet of showroom space in the Madison market. We began adding several new categories of furniture, and in 2005 the name was changed to Don’s Home Furniture to reflect the fact that we truly were more than just an oak store. Sofas, area rugs, accessories and wall art were now a part of the landscape in both showrooms. In late 2006 the decision was made to open one large location on the beltline and close the two other locations. This move would put the location in what many people in Dane county perceive as “Furniture Row”, a location where people can shop several furniture stores within a stone’s throw of one another. In early 2007 the move was complete. Since the 2007 opening of the single location on the beltline, Don’s Home Furniture has continued to grow by leaps and bounds. With record sales in 2007 and amazing sales through the first nine months of 2008, it was a confirmation that the move was one of the best things we could have done as a company. When things started to go south for the economy in October of 2008, the entire staff wondered if the customers that had followed Don’s through the years would continue to invest in the quality that we are known for. For almost every furniture store in the country, the years following the crash of 2008 have been very tough. Amazingly, Don’s sales have remained very steady and in 2010 even began to grow again. Today, with annual sales in the area of 6 million dollars, and over 140 different Amish vendors, Don’s Home Furniture continues to impress those that make their way to the store. The decision to sell nothing but American-made furniture has been one of the best decisions that our company could have made. We believe that if you are an American company, you should sell American products whenever possible. First-time shoppers are stunned to find that, for close to what you would pay at a big-box store on furniture that is mass-produced, you can invest in a handcrafted heirloom that will last for generations. While not all of the furniture that we sell is Amish-made, the vast majority (about 95 percent) is. So, the goal remains the same as when Don first began -offer quality products at reasonable prices- just with a lot more to choose from. While Blaine and Tina are no longer married, the entire family is still very involved and working every day at the store. We welcome your comments and suggestions, so please feel free to send us an e-mail at info@donshomefurniture.com. Thanks for taking the time to visit our website. Thank you, from the entire family and the employees of Don’s Home Furniture, for your continued patronage through what has certainly been a whirlwind adventure. We couldn’t have done it without you.